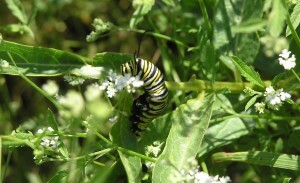 A monarch caterpillar eats antelope horn milkweed growing at Shield Ranch. A few weeks ago, I visited Shield Ranch, a 6,000-acre property devoted to responsible cattle management and wildlife conservation. I made the visit to the ranch – less than 20 miles west of my home in Austin – to test a new tool being designed to more accurately assess habitat for the monarch butterfly. Standing in a field of wildflowers with a team of scientists, we used the monarch butterfly habitat quantification tool to measure vegetation and determine what monarch habitat was available on the property. We’ve used similar habitat quantification tools for other at-risk wildlife like the lesser prairie-chicken and greater sage-grouse, but this was the first time we tested a tool for monarch butterfly habitat. We recently tested the habitat quantification tool at Shield Ranch and will run pilot projects with Corn Belt farmers and ranchers throughout the summer. The results will support the launch of the Monarch Habitat Exchange in 2017. The habitat quantification tool is a scientifically robust method of appraising habitat quantity and quality. 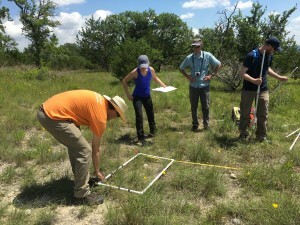 It uses proven vegetation measurement techniques such as transects and quadrats to determine milkweed and nectar plant density and diversity in areas that are targeted for restoration and conservation. The results will tell us the suitability of a particular area for monarch breeding and nectaring. This information is important in two key ways: it informs us what kind of management is needed to restore, enhance and maintain monarch habitat, and it tells us how many credits a farmer or rancher has to potentially sell through the Monarch Butterfly Habitat Exchange. What is the Monarch Butterfly Habitat Exchange? The Monarch Butterfly Habitat Exchange is an emerging conservation program designed to provide incentives for farmers and ranchers to conserve and create habitat for the monarch butterfly. Farmers and ranchers can earn credits for these activities, which can then be sold through the exchange to buyers or investors. The exchange makes growing milkweed – the monarch’s key habitat – a part of the landowner’s business model, just like herding cattle or harvesting a crop. Agribusiness, food companies and chemical companies all have an incentive to invest in the Monarch Butterfly Habitat Exchange and implement conservation on the ground quickly, before an Endangered Species Act listing is required to bring the butterfly back from the brink. Why are farmers and ranchers involved? 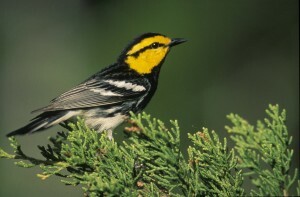 Twenty ranches are enrolled in the Fort Hood Recovery Credit System to conserve habitat for the golden-cheeked warbler. Learn more here. Farmers and ranchers are critical to protecting habitat for the monarch butterfly, and for a variety of other wildlife. That’s because 75 percent of all land in the United States is managed by private landowners, with farmers and ranchers being some of the largest landowners in the country. While conducting the field test for the monarch habitat quantification tool on Shield Ranch, I heard an endangered golden-cheeked warbler sing from a nearby canyon. It put a smile on my face, as I worked with Texas ranchers over a decade ago to build an exchange-like program for the warbler. That program enrolled 20 local landowners in conservation activities, together earning a total of nearly $2 million in new revenue. Compared to the monarch butterfly, the golden-cheeked warbler’s range is almost an afterthought, residing only in select sites scattered throughout 33 counties in central Texas. The monarch butterfly’s range spans all of North America, touching 3 countries and the entire continental U.S. But hearing a golden-cheeked warbler sing while testing the monarch butterfly tool was yet another reminder to me of how vital working lands are to conserving at-risk species, and how important a role farmers and ranchers will play in writing the next chapter for the monarch butterfly. This entry was posted in Habitat Exchange and tagged agriculture, conservation, Endangered Species Act, environmental defense fund, farmers, farming, golden cheeked warbler, habitat, land stewardship, milkweed, monarch butterfly, ranchers, ranching, sustainability, sustainable agriculture, wildlife. Bookmark the permalink. Both comments and trackbacks are currently closed.